Our new paper on the properties of stem cell derived striatial interneurons done in collaboration with Professor Meng Li (NMHRI, Cardiff). This entry was posted in Uncategorized on January 29, 2019 by Adam Errington. Dual function of thalamic low-vigilance state oscillations: rhythm-regulation and plasticity. (2018) Nature Reviews Neuroscience 19(2):107-118. During inattentive wakefulness and non-rapid eye movement (NREM) sleep, the neocortex and thalamus cooperatively engage in rhythmic activities that are exquisitely reflected in the electroencephalogram as distinctive rhythms spanning a range of frequencies from <1 Hz slow waves to 13 Hz alpha waves. In the thalamus, these diverse activities emerge through the interaction of cell-intrinsic mechanisms and local and long-range synaptic inputs. One crucial feature, however, unifies thalamic oscillations of different frequencies: repetitive burst firing driven by voltage-dependent Ca2+ spikes. Recent evidence reveals that thalamic Ca2+ spikes are inextricably linked to global somatodendritic Ca2+ transients and are essential for several forms of thalamic plasticity. Thus, we propose herein that alongside their rhythm-regulation function, thalamic oscillations of low-vigilance states have a plasticity function that, through modifications of synaptic strength and cellular excitability in local neuronal assemblies, can shape ongoing oscillations during inattention and NREM sleep and may potentially reconfigure thalamic networks for faithful information processing during attentive wakefulness. This entry was posted in Uncategorized on January 11, 2018 by Adam Errington. Variable action potential backpropagation during tonic firing and low-threshold spike bursts in thalamocortical but not thalamic reticular nucleus neurons. (2017) The Journal of Neuroscience, 37(21) 5319-5333. In neurons throughout the brain it has been shown that backpropagation of action potentials into the dendritic tree is important for a number of physiological processes in neurons, particularly plasticity processes. In both thalamocortical (TC) and thalamic reticular nucleus (TRN) neurons the full extent of action potential backpropagation has remained unclear despite calcium imaging and computational modelling studies. In this study we have used 2-photon targeted dendritic recordings to directly measure the backpropagation of action potentials into TC and TRN neuron dendrites. In these neurons we find that action potentials are initiated in the region close to the soma, most likely the axon initial segment, and are able to backpropagate into the dendritic tree. However, compared with other cell types backpropagation into the dendritic tree in not particularly efficient in TC and TRN neurons. We also show that in TC neurons the extent of action potential backpropagation varies between low-threshold spike bursts and tonic firing but this does not occur in TRN neurons where bAPs are unaffected by firing mode. These data support earlier findings using 2-photon Ca2+-imaging and demonstrate that there is a clear difference in dendritic signalling in thalamic neurons during tonic firing, which is prevalent during wakefulness, and low-threshold spike bursts that occur during lower vigilance states. This entry was posted in Uncategorized on April 10, 2017 by Adam Errington. We have recently held our Division of Psychological Medicine and Clinical Neurosciences senior staff retreat at the beautiful Gregynog Hall in Powys, mid-Wales. Two days of stimulating discussions set out the future plans for continuing the excellent and world leading work done by Cardiff researchers in neuropsychiatric genetics and genomics and clinical neurosciences for the next decade and beyond. A big thank you to all of the speakers and organisers for a great meeting. This entry was posted in Uncategorized on April 9, 2017 by Adam Errington. We have added our multi-compartmental Neuron model of a dLGN thalamocortical neuron to the Model DB repository. This model is based on our dendritic recordings from thalamocortical neurons and accurately reproduces the firing behaviour and synaptic integration properties of thalamocortical neurons. The model was used in our publications in The Journal of Neuroscience (Connelly et al., 2015, 2016). This entry was posted in Uncategorized on January 30, 2017 by Adam Errington. The numerically dominant synaptic input to sensory thalamic nuclei including the dorsal lateral geniculate nucleus (dLGN), does not, as might be expected, come from sensory sources (e.g retinal ganglion cells) but, in fact, comes from cortical feedback. Up to 50% of synapses on thalamocortical (TC) neurons are corticothalamic (CT) inputs from layer VI cortical pyramidal neurons. These synapses produce very small EPSPs at the soma of TC neurons and have consequently traditionally been considered as ‘modulators’ of TC neuron activity. One aspect of our understanding of CT feedback to TC neurons has, however, remained unknown. Specifically, how TC neurons integrate these CT numerous inputs and the effects that these inputs produce locally in dendrites. We have published a paper in The Journal of Neuroscience that has addressed some of these questions and provides new insight into the role of CT feedback in TC neurons. By using paired somatodendritic patch clamp recordings, patterned two photon glutamate uncaging and computational modelling we have demonstrated in vitro that individual quantal sized CT synapses produce large EPSPs in dendrites that are strongly attenuated as they propagate to the soma. However, because of the dendritic properties (see also Connelly et al., 2015) of TC neurons, CT EPSPs are ‘passively normalized’ such that, unlike synaptic potentials in dendrites of other neurons, the amplitude and shape of CT EPSPs is almost entirely unaffected by the location of the synapse within the dendritic tree. Thus, CT feedback seems to be a synaptic democracy with all inputs having an equal effect on TC neuron membrane potential. Our new data also shows that TC neuron dendrites have mechanisms, involving T-type Ca2+ channels and NMDA receptors, that can amplify CT feedback in a manner dependent upon the temporal pattern of the input. We suggest that these mechanisms might significantly increase the range of responses that CT feedback can produce in TC neurons to exert their modulatory effects. In fact, we find that under certain conditions CT feedback might be sufficient to act as a ‘conditional driver’ of TC neuron firing. Follow the link above to read the paper in full (freely available). This entry was posted in Uncategorized on March 30, 2016 by Adam Errington. (2016) Frontiers in Neural Circuits 9(89). This entry was posted in Publications on January 4, 2016 by Adam Errington. The global spike: conserved dendritic properties enable unique Ca2+ spike generation in low threshold spiking neurons. (2015) The Journal of Neuroscience, 35(47) 15505-15522. see also This Week in the Journal, The Journal of Neuroscience 35(47), i. 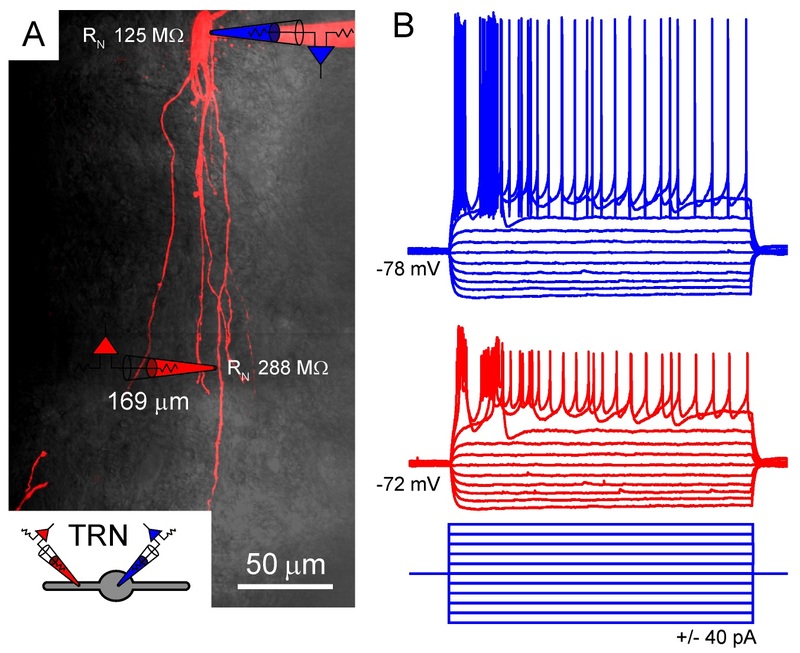 Our latest work on the dendritic properties of thalamocortical (TC) and thalamic reticular nucleus (TRN) neurons has been published in The Journal of Neuroscience. In this paper we describe the mechanism that underlies the generation of low threshold spikes (LTS) in TC and TRN neurons. We show how the electrical properties of dendrites are highly conserved between these cells and how they are essential for the generation of LTS. For the first time we performed direct electrical recordings from the thin dendrites of TC and TRN neurons. We find that the dendrites of these two different types of neuron share a number of important dendritic properties that are necessary for their ability to generate LTS. In particular, these neurons are very electrotonically compact from the viewpoint of the soma and the entire dendritic tree can be depolarized in unison to recruit dendritic T-type Ca2+ channels that are widely distributed in physical space. We show that the mechanisms underlying the LTS in LT-spiking neurons means that it is generated in a markedly different manner to other neuronal spikes including sodium mediated action potentials, dendritic Ca2+ spikes and NMDA spike/plateaus. This entry was posted in Publications on November 25, 2015 by Adam Errington.